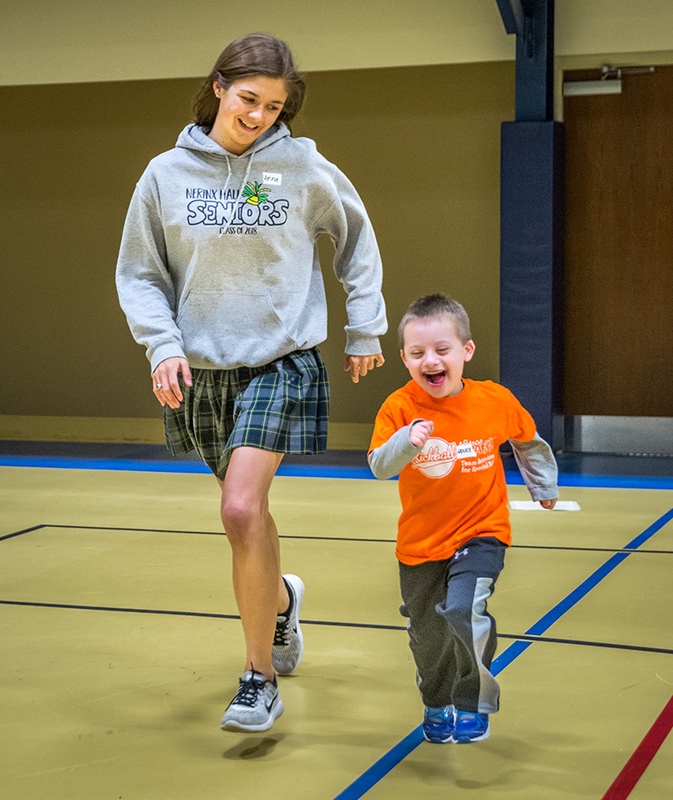 Archbishop May service award winner Anna Schuermann played with Xander Wurman at Team Activities for Special Kids, a nonprofit organization dedicated to enriching the lives of children with special needs by providing them with athletic and social opportunities. Anna Schuermann sat patiently on the floor with her legs folded while her little buddy Xander Wurman stood behind her combing through her hair with his fingers. Schuermann was at her regular weekly volunteer position with Team Activities for Special Kids (TASK), a nonprofit organization dedicated to enriching the lives of children with special needs by providing them with athletic and social opportunities. Schuermann, a Nerinx Hall senior, and another TASK volunteer, Allison Bettlach from Bishop DuBourg High School, are among 25 students from Catholic high schools in the archdiocese recognized recently with the 2018 Archbishop May Service Award. A member of Christ the King Parish in University City, Schuermann said her faith life is connected with her service. “That’s how I experience God in my life and see Him working in the world,” she said. It’s simply something she wants to do, and it doesn’t feel like work to her. Archbishop May service award winner Anna Schuermann, a Nerinx Hall senior, mentored Xander Wurman at TASK on April 18. She connects her faith life with service. “That’s how I experience God in my life and see Him working in the world,” she said. At TASK, she said, the children “have so much fun being around you that doing the activity” is just a bonus. At Nerinx, Schuermann is president of the Outreach service club and helps plan and lead its assembly, coat drive and adopt-a-family drive for St. Francis Community Services. She also connects other students to volunteer efforts. Schuermann, who plans to attend Marquette University to study physical therapy, also is involved in the cooking club and is a manager of the basketball team. Nerinx is a supportive and inclusive community, she said. “Every day when I come to school I know somebody’s going to ask how I am doing. It’s really a feeling of home,” Schuermann said. Bettlach, a Bishop DuBourg senior, went with a friend in eighth grade, Sophie Staue, to volunteer at a TASK camp at Christian Brothers College High School. She was nervous and excited about hosting the program for the children with a wide range of disabilities. Bettlach quickly found joy in the work and returned to TASK camps every year as a volunteer. Juan Jose Barzallo of DuBourg’s campus ministry wrote in nominating Bettlach that she “has always strived to be both a great student and a great community member.” He pointed out that she has a 4.14 grade point average in the DuBourg Academy of Advanced Studies and made honor roll every semester. In addition to TASK, Bettlach is a leader in her school’s Pro-Life Club and went to Washington, D.C., on the March for Life, volunteered with elderly neighbors at DuBourg House, organized blood drives, served as a peer mentor, helped rebuild homes in New Orleans and more. Bettlach, who will attend Loyola University in Chicago in the fall, also has a passion for social justice. At a workshop for students representing schools in the Archdiocesan Athletic Association on “Why We Play,” Bettlach took a message from a speaker about racial stereotyping, awareness and sensitivity back to DuBourg and petitioned the leadership to be more welcoming to diversity. The school responded with a number of initiatives. The May Award is especially meaningful because it included a service day and program for the honorees at various sites in St. Louis, Bettlach said. “It really showed me a lot about St. Louis and motivated me to get more involved,” she said. Paul Kraus, volunteer coordinator for Team Activities for Special Kids, said many of the volunteers come from Catholic high schools in the archdiocese. It’s especially endearing to the students because it’s a one-on-one, relational experience, he said. TASK enriches the lives of children with special needs by providing opportunities for them to participate in sports, recreational and social activities. It is run by a small staff and volunteers, based at facilities in Fenton with a modern gym and ballfields.